2). Heat oil in saucepan and fry garlic and onion until soft, add mince and brown it for 5 minutes, season and set aside. 2). In another large saucepan, heat oil and fry garlic and onion until soft and transluscent , add tomato and cook for a minute until soft, add 2 cans of tomato, tomato paste, water and boil, simmer for 10 minutes, add basils conitue simmering for one minute more then season with sugar, salt and pepper. 3). 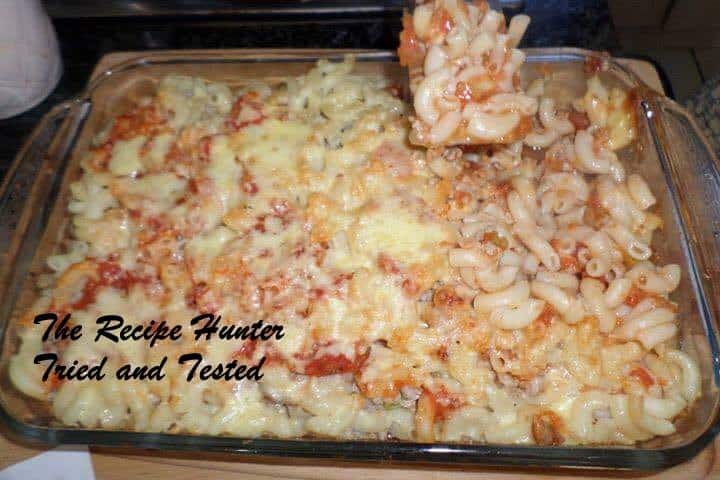 Pour sauce in baking dish about 1/4 of it, add macaroni then cooked minced and top with cheese, repeat until all macaroni,minced and sauce are used then top with lots of mozarrella cheese. Bake for 25 minutes until cheese are melting ..enjoy while still hot !